Microcosmic Shooter is another point and click adventure puzzle game from gameslist. 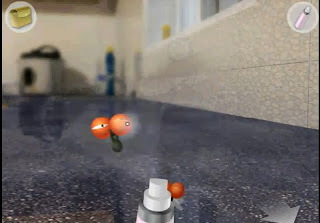 In this game, you see a mosquito while you are brushing - you are annoyed by it so you try to kill it but something happened that shrunk your body. Now that you are tiny, it will take more than just a slap to take on the mosquito. Collect items and tools that you will need to battle the flying pesky insect and figure out how you can get back to your normal size. Meanwhile here is a Microcosmic Shooter walkthrough to show you the solution in the game.